Larson Electronics has added to its extensive range of industrial grade lighting equipment with the release of a 120 watt quadpod mounted LED work light that is built to provide a high power lighting solution that requires minimal setup time or effort. This light assembly produces a wide flood pattern that makes it ideal for illuminating large work spaces and job sites. The WAL-QP26-2XWP60E-50 from Larson Electronics is a quadpod mounted work area light that provides 10,800 lumens of high-intensity LED light for bright illumination of a desired area. 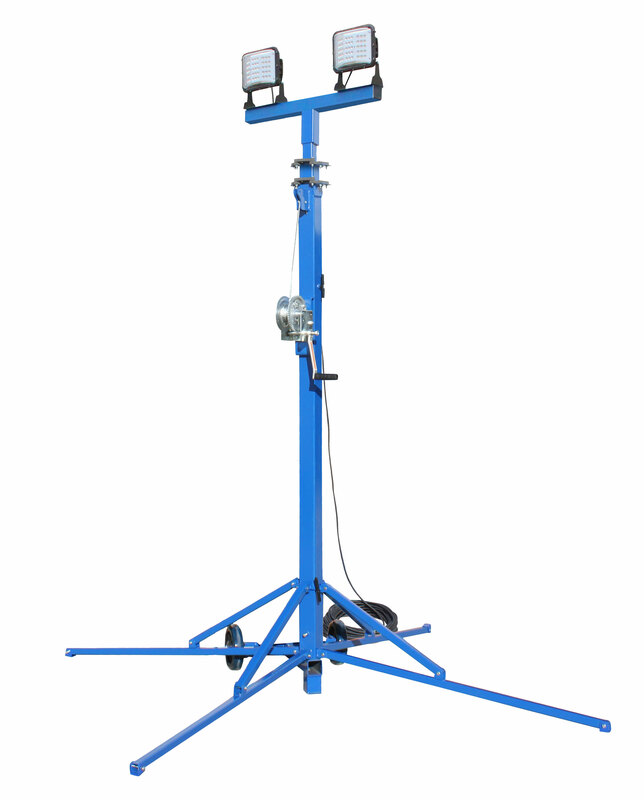 This portable light tower has a removable dual light head assembly mounted on top of a four leg aluminum quadpod equipped with wheels for easy positioning from one work space to another. The light head assembly on this tower contains two 60 watt LED emitters that produce 5,400 lumens each. These lamps are independently adjustable, allowing operators to adjust each light for maximum coverage of the work space. This adjustable and collapsible quadpod can be extended to 26 feet and collapsed to 11 feet. The light assembly on this unit can be removed by releasing the hand knob and sliding the light and mounting bracket off of the center support while the legs can be collapsed, aiding in deployment, storage and transport. Included with this work light is 50 feet of SOOW cord with a 5-15 straight blade plug and is configured to operate on 120 to 277 volts AC. This heavy duty unit is designed for use in inclement conditions and for overall longevity in difficult construction environments with heavy duty aluminum construction and stainless steel hardware for maximum durability. Larson Electronics work lights are designed for industrial, emergency response and military applications, where the operators are working in harsh, destructive environments and require durable, dependable lighting.